There’s a long list of hardware, from sewing machines through to dremels. For making a costume you must be creative with your tools. I use a dress form, scissors, needles, iron, box cutters, hot air gun, electric soldering iron, tiny saw, paintbrush, sander, punch pliers and riveting pliers.. the list has no end, because you constantly discover new tools you can use. 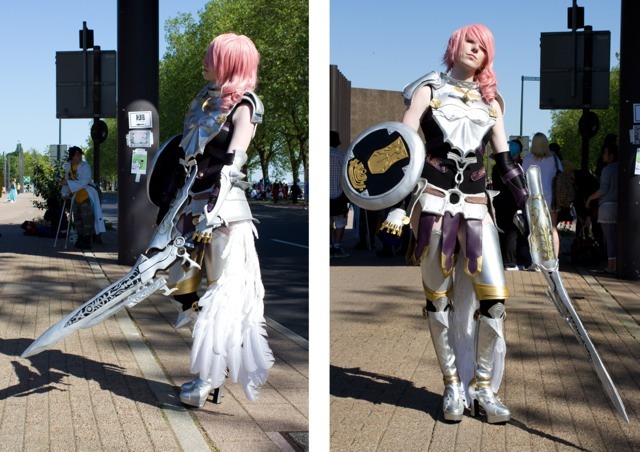 Bilden ovan visar henne som Lightning från Final Fantasy XIII-2, tagen från Laura Jensens (tyska) Tumblr.